It had been a long, hard week, and I was heading home one day in 1994. I was a computer consultant, specializing in on-site training, which meant I was a typical road warrior. My work “week” normally started Sunday morning when I caught a flight to wherever I would teach the next week, and ended with a flight home on Friday, arriving home around midnight. Trying to be a good trainer was rewarding but exhausting. Anyone who’s taught knows that you have to be on your toes all the time. You need to stay tuned in and responsive to your students. By Friday evening I was pretty well worn out. One of the few perks of flying as much as I did was getting an upgrades to first class without much difficulty. This flight was no exception. It was non-stop from Kennedy airport in New York to LAX in Los Angeles. 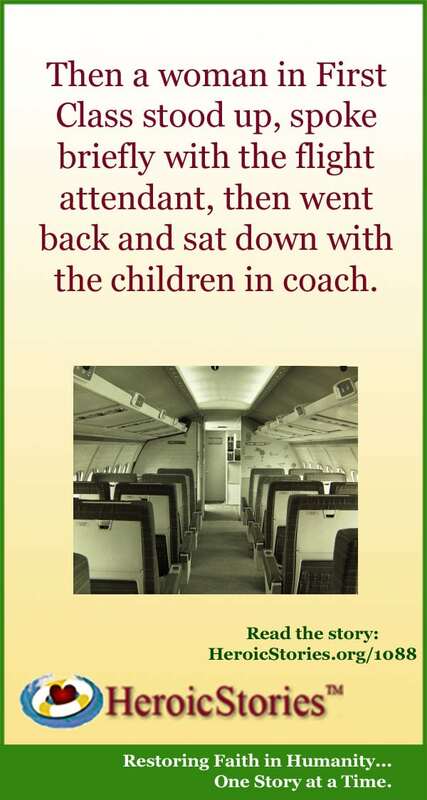 As I settled into my seat, I noticed two young, unaccompanied children being seated by the stewardess in the front row of the Coach section. They appeared to be a brother and sister, about 6 or 7 years old. I groaned inwardly, as I thought of five hours with two young children right behind me and no parents in sight. My worst fears were soon realized. The flight attendants tried to keep an eye on the kids, bringing them coloring books and crayons. But it’s hard to be 6- or 7-year-olds, cooped up and all alone on a six-hour plane flight. The flight attendants had a full plane to deal with. The noise level from the seats behind me was rising. Then a woman in First Class stood up, spoke briefly with the flight attendant, then went back and sat down with the children in coach. For the next four plus hours, until the flight landed, that lady talked and colored, and told stories, and generally kept those kids occupied, happy, and quiet. She seemed to be totally enjoying herself. When we finally arrived in LA, she turned the two children over to the Flight Attendant and disappeared down the aisle to the exit. I was amazed and grateful that this woman was willing to give up her pampered seat in First Class, go sit in coach, and entertain two nervous, bored children on a long trip. She didn’t make a big deal out of it, she just did it. All of us seated close to those children were grateful for her intervention. Even better, the two children had a delightful experience rather than a miserable trip. Witnessing this, it really hit home to me that one person can make a difference, and it doesn’t matter who you are. Oh, did I mention I recognized her? The woman who moved from First Class to Coach to calm the children? It was Dolly Parton. Dolly (It costs alot of money to look this cheap!) Parton is a treasure, I’ve never met her, but am sure I would thoroughly enjoy the experience. I remember when this story first ran, glad to see it again. Chances are Dolly had as good a time as those kids did on that flight, she’s that kind of person. This just goes to show that, so many times, celebrities are real people just like the rest of us. Dolly Parton has always and will always be my nominee for greatest person and greatest American ever. She is always kind and generous and a wonderful example for all of us to follow all the time. Too bad more of today’s “entertainers’ can’t follow her example of good CLEAN fun. I can almost see Dolly…….smiling, kind, loving those children. What a lady. We need more and more people like her, that really CARE. Whenever I have stepped out of my comfort zone, and done something that needed done, I have never regretted it. However, when I havent listened to that small voice, inside, I have ALWAYS regretted it. This is an example of just why Miss Dolly is and always will be my idol! What a great surprise ending! And what a terrific example that she set that day. Ms. Parton is such a refreshing change from the typical Hollyweird entertainer type. She seems to know what the right thing to do is, does it herself, and doesn’t demand attention for it. Perhaps that’s why her fans love her so much. I’ve never been a fan of her music, but I’m a fan of her as a person.